Enlarge image . . . . .
From Harvard Women’s Health Watch . . . . . However, sometimes inflammation persists, day in and day out, even when you are not threatened by a foreign invader. That’s when inflammation can become your enemy. Many major diseases that plague us—including cancer, heart disease, diabetes, arthritis, depression, and Alzheimer’s—have been linked to chronic inflammation. On the flip side are foods and beverages that have been found to reduce the risk of inflammation, and with it, chronic disease, says Dr. Hu. He notes in particular fruits and vegetables such as blueberries, apples, and leafy greens that are high in natural antioxidants and polyphenols—protective compounds found in plants. To reduce levels of inflammation, aim for an overall healthy diet. If you’re looking for an eating plan that closely follows the tenets of anti-inflammatory eating, consider the Mediterranean diet, which is high in fruits, vegetables, nuts, whole grains, fish, and healthy oils. Anti-Inflammatory Diet for Arthritis . . . . .
Dr. Weil’s Anti-Inflammatory Diet . 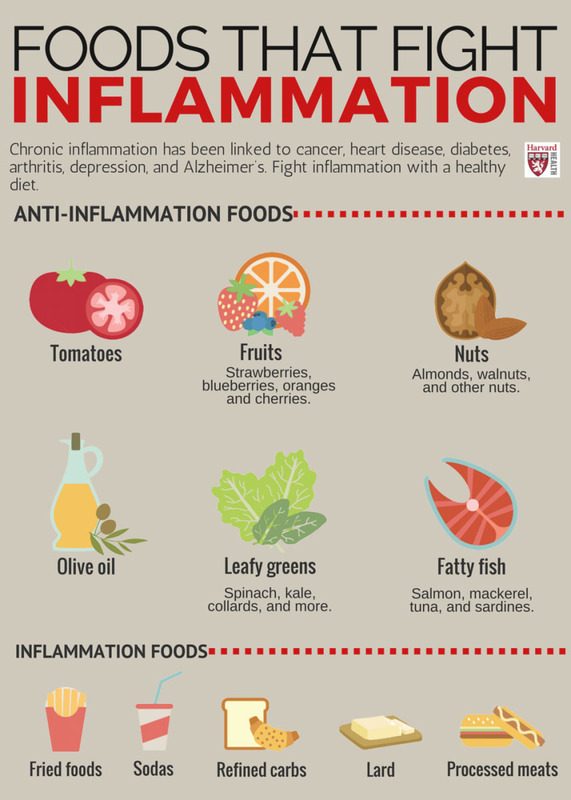 . . . .
13+ Anti-Inflammatory Foods for Fighting Pain . . . . .
Natural anti-inflammatory agents for pain relief . . . . .